New Times SLO provides a detailed look at the local fishing industry, with firsthand accounts from deckhands providing valuable insights to the real state of fishing off the California coast, compared to things people might find frightening in the global fishing industry. 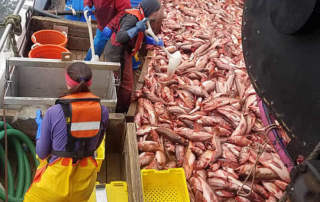 Check it out HERE And watch our callendar, Facebook page, and local news to keep up with dockside sales of Pioneer Seafoods sustainably caught local fish! Pioneer Seafoods was featured in an article in etc Magazine! Learn about the challenges of the permitting problems to be a fisherman and see a good explanation about the revolutionary new technology invented by Guiseppe Pennisi to reduce bycatch, release juvenile fish and avoid contact with the ocean bottom. Click here to read the article. Or see it embedded on the page below. Glide Memorial Church Newsletter showing the article about Pioneer Seafood. We are so grateful for the wonderful article that Glide Memorial Church wrote about Pioneer Seafoods. When we go out fishing, we always save a bunch of fish for Glide Memorial to serve in their kitchen. They tell us that "Fresh Fish Fridays" is now their most popular meals for feeding the disadvantaged local people in San Francisco. Click Here to read the full article. Fresh Fish sale Sunday 10/29 from The Pioneer boat docked at Pier 47 at the San Francisco Wharf. Fresh Fish Sale direct off the boat at Pier 47 starting 7am Sunday 10/29 and continuing until we sell out! Look for the banner over our boat -The Pioneer! We will have: Chilipepper Rockfish, Petrale Sole, Sand Dabs, Widow Rockfish, Skates, Flag Rockfish, Green Spots, Green Stripes, Starry Rockfish and some Ling Cod! We are always happy to meet fish lovers, and we look forward to showing you our beautiful sustainably harvested catch!